The Magellan is one of the biggest boats in the Whale shark fleet and measures 20m. It is the envy of many skippers with 48m2 of deck space which includes 32m2 of shaded area. To avoid disappointment we do recommend to book in advance. School holiday periods in April and July can book out months in advance so if travelling to Ningaloo during these times then pre booking is highly recommended. We also suggest that booking your Whale shark tour earlier in your stay rather than on the last day is advisable. This will offer you some flexibility should the unfortunate occur and you do not see a Whale shark during April – July. WHY SHOULD WE CHOOSE KINGS? 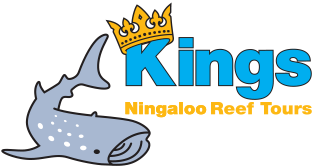 Kings Ningaloo Reef Tours have been conducting Whale shark tours for over 30 years on Ningaloo Reef. Swimming with Whale sharks and now Humpback Whales is all we do, we are passionate about the Reef and its inhabitants. We understand that for many people this is a once in a lifetime experience that can take months or years to plan so with this in mind we do all we can to provide the best experience and the most memorable day of your life. HOW MANY PEOPLE DO YOU TAKE ON BOARD? For our Whale shark Snorkel Adventure tour the maximum number of swimmers that we take on board is 20 with an additional 2 observers. Two groups of 10 are formed with only one group at a time in the water with a Whale shark. For our Humpback Whale swims we can take a maximum of 21 swimmers with 3 groups of 7 people in each. Our tours are all inclusive of transfers, equipment, meals, refreshments, government charges and photos. All you need to bring on the day is your personal effects such as swimwear, hat, towel, sunscreen and sunglasses. We do recommend a jacket or change of clothes in cooler weather. You are more than welcome to bring your own camera if you like however our photographer is on board to capture all those special moments. DO YOU USE A SPOTTER PLANE? Absolutely. We have a spotter plane in the air for all of our tours to find Whale Sharks and Humpback Whales for us to swim with. Using a spotter plane reduces the amount of time spent searching for a Whale shark but they can also alert us to any other marine life that is in the area such as Manta Rays, Humpback Whales, Dugongs, Orcas and more. Sharing a plane allows us and a select few companies to pool resources and keep the spotter plane up in the air for longer. This means that if the Whale sharks have decided to have a sleep in, our plane is able to stay up for several hours until we can locate one. We can absolutely cater to your dietary needs. If you have any allergies or dietary requirements please let us know at time of booking. Our caterer will take all requirements into consideration and any food served will have an ingredient list onboard to ensure the wellbeing of our passengers. WHAT IF WE DON'T SEE A WHALE SHARK? Our Whale shark Snorkel Adventure Tours (April – July) all include our Sighting Guarantee. So if you come out on one of these tours and do not see a Whale shark we will offer you the next available tour for FREE as a second chance to do so. If you are not available for this repeat tour a partial refund can be provided *see terms and conditions* Our success rate for the past few years for the April - July period has been 100%. So the odds are definitely in your favour. CAN YOU GUARANTEE A SWIM WITH A HUMPBACK WHALE? Humpback Whales will begin their migration along our coastline generally between June – October. With an estimated 30 000 whales making this journey there are plenty of opportunities to see them during tours within this period. From the 1st August we are able to offer our Whale shark Humpback Whale Eco Tour participants the opportunity to enter the water with Humpback Whales. Our professionally trained staff will determine on the day whether conditions are suitable in order for our passengers to enter the water with a Humpback Whale. While every effort is made to provide you with the opportunity to see and interact with the wildlife, we cannot guarantee nature. Our passenger safety is our first priority so if the behavior of the Humpback Whales or conditions are not suitable on the day then our interactions will be from the vessel rather than in the water. WHAT IF I'M NOT CONFIDENT IN THE WATER? Our experienced professional guides are able to put even the most nervous swimmer at ease. They are able to offer snorkel tuition during our reef snorkels and can even hold your hand as they guide you through the experience. On board we have a choice of swim vests, pool noodles and a safety tube for additional flotation and reassurance. If you aren’t confident or would like some additional tuition please let us know at time of booking so we can ensure you make the most of your Ningaloo Reef experience. WHEN IS THE BEST TIME TO VISIT NINGALOO? We recommend that if you are worried about being seasick during your tour then it is best to err on the side of caution. Prior to your tour date, visit your local pharmacy for advice regarding what seasickness medication may be best for you. Unfortunately no refunds can be given should you suffer from seasickness during your tour.